Cornflower, also known as bluebottle, boutonniere flower, cyani, hurtsickle, and bachelor’s button, is a favorite wedding flower due to its blue-purple hues and soft petals. As a national flower of Germany, they are reminiscent of Agapanthus flowers with similar looking petals. They make for an excellent filler and use as table centerpieces, coming in red, pink, blue/purple, and white. They are generally available from the late spring to early fall. Buy them at our discount prices! The cornflower is a beautiful, multi-layered, brightly-colored flower. It livens up your surroundings and infuses your home with color.This tall, single flower leaves you with a feeling of cheeriness and vitality. Its defiant blue color is charming. 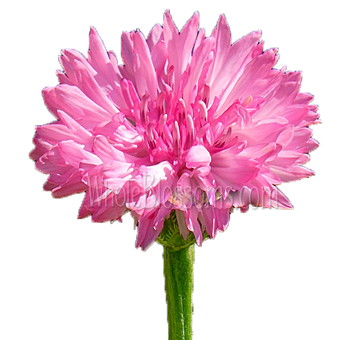 The cornflower is easily recognizable and is an essential addition to flower arrangements. It is an absolute must-have in weddings. 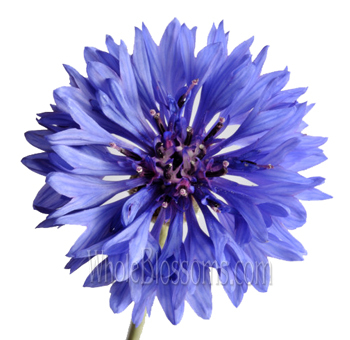 Cornflowers are alluring and radiate calm energy. They have a particular connotation with expressions of love. They are very popular in North America, Australia, and Europe. Cornflowers stand out by themselves when used in different shades, but they complement every bouquet they are included in. The cornflower also called blue bottle, and bachelor button flower is an annual flowering plant. Its scientific name is Centaureacyanus. It belongs to the family of daisies.Originally from the Mediterranean, it earned its name because it grew in large numbers in cornfields in England.It evokes feelings of affection, strength, health, and prosperity. Even a single glance at these cheerful, bright flowers can refresh your being. Its history is surprising due to its many meanings. The cornflower is the national flower of both Estonia and Germany. Queen Louise, while fleeing the French, hid her children in a field of cornflowers. The flowers make many appearances in Irish folktales.It stands for good luck and an abundance of health& wealth. The cornflower was nearly wiped out of Europe due to herbicides, but they are now widely available at florists. The cornflower is unique in its construction. The plant has a single flower that is 1.5 inches wide. It grows tall and vertical and can reach heights of two feet. The flower is actually made up of one or more rows of trumpet-shaped florets. This uniquelayered shape is what makes the cornflower charming. Their narrow, sturdy stem allows you to use them for a variety of purposes. It is the perfect flower with which you can express your creativity. Cornflowers can be used in food dressing, hall & card decorations, and in bouquets. This flower is long-lasting and tough in nature. It is available both summer and winter. Their colorful nature is all the more evident in the dry and wintry seasons of the year. It can be a comforting companion when paired with home decorations. The pastel colors of the cornflower are beautiful. The vivid blue variety is so unique that it was given a name of its own—Cornflower Blue. Young men in Europe often wore cornflowers as a symbol of their love, hence the name blue bachelor buttons. This is why cornflowers are so essential in wedding bouquets and decorations. Their long-lasting colors represent undying love.Cornflowers are found in many different shades of blue,pink, purple cornflowers, white and deep maroon.The center of the flower generally has small, curving petals that are dark in color. They give an attractive look to the rest of the lighter, bigger florets.Cornflowers are most popularly used in bunches of blue, white and pink. By themselves, the cornflowers lend vibrancy and a splash of color to their surroundings. They are perfect for centerpiece attractions. It is sure to draw in a passer-by to stop and stare, no matter where it is used. They are known to last longer and do not fade easily. Archaeologists found blue cornflowers buried alongside King Tutankhamun when they discovered his tomb. The flowers had retained their color even after several centuries. Cornflowers are edible and are often used in salads and desserts. The strong coloring is also used in herbal teas. The pastel colors are soothing to the eyes and relieve fatigue. Despite its loud, eye-catching nature, the cornflowers can be surprisingly subtle. They can complement flowers of various shapes and colors.Deep blue cornflowers work beautifully with white flowers, which make them absolutely necessary at weddings. They are often ordered in wholesale bulk to decorate weddings and celebrations. 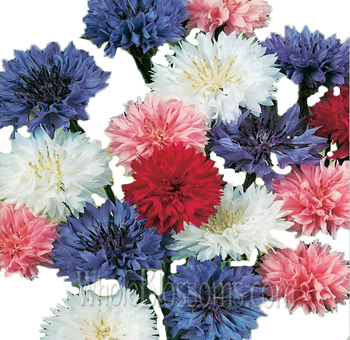 The cornflowers are perfect for congratulatory bouquets and for home decorations. Because of their sturdy nature, they can be used for a variety of different purposes.When used in flower arrangements, they are enchanting and inspire affection. These beautiful flowers are a must-have at celebrations of any kind. They are soothing companions during both summer and winter.To buy fresh cornflowers in bulk, make sure you buy from experienced and trustworthy florists. Whole Blossoms offer 24/7 delivery of fresh flowers to your doorstep at just the click of a button. Fresh, bright cornflowers are perfect for weddings and to give a boost of color to your surroundings. Its vivid blue lifts up any blue, gloomy feelings.It rejuvenates and re-energizes your being. A bouquet of the cornflowers is sure to bring a long-lasting smile to the faces of your cherished ones.